In my previous post, I shared with you how to to Convert Webpages To PDF Online, i.e sites to convert any web page to PDF online. So sometimes it's just easier and better to convert your documents or files to pdf format so that you are sure that someone else can open it on a smartphone, computer, tablet or other device. In this article, i will show you how to Convert any Document or File to PDF through Online PDF-Converter. 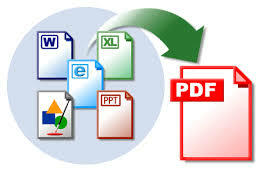 PDF stands for Portable Document Format and is a file format created by Adobe. PDF is used to present documents in a way, so that everybody can view it using many different types of software such as Adobe Reader or on all kinds of operating systems such as Windows, Mac OS X, Linux, Android, IOS and more. You can convert documents and files like Microsoft Word (.doc), Power point (.ppt), Excel Document (.xls), Microsoft Word Open XML (.docx), Open Document Text (.odt), Text File (.txt) and much more document and file types to PDF. 3. Go to the document or file on your computer that you want to convert to pdf. 4. Select the document or file and click on "Open". 5. Click on "Convert" and Online2pdf.com will start the converting process. 6. When the converting process is finished, the download will start immediately. By default the file will be saved in the Downloads folder on your computer. If a window appears then follow step 7 and 8. 8. Choose a location on your pc where you want to save the pdf file and click on "Save". Did you found any of methods or processes above confusing, no need to worry, that’s why we have the comment box below for you. Also, please feel free to ask any questions, if any. You can also share with us any other way or site you have used to convert document or files to PDF.